Brian K. Vaughan is becoming a writer that I will buy any #1 from. I've been digging Saga and Doctor Strange: The Oath still stands as one of the best Doctor Strange stories. This time he's working with Cliff Chiang, who also is among my favorites. WIth a team like that, this book should be a home run. In actuality, it's more of a grand slam. The book opens with a dream sequence that will give you some Saga flashbacks, but quickly settles into the morning of a girl running her paper route the morning after Halloween. The world is established and you know who you like and who you don't amost immediately. It's one of the things I've grown to love about Vaughan's writing style, he is able to convey so much of a character through just a few lines. And what seems like a straightforward story takes a quick turn into something else entirely, and it's awesome. Chiang's art is top notch as always. I've missed him since he left Wonder Woman, and it'll be nice to have him back in my life on a monthly basis. He does so much with facial expressions and the direction of each panel that really keeps the momentum of the story flying forward. And honestly, there's not a bad part of the issue. The colors by Matt Wilson do a great job of portraying both the mood and the setting, and the letters by Jard K Fletcher just look damn cool. 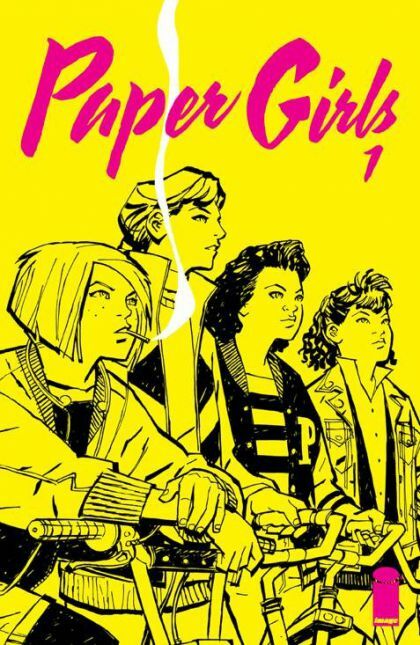 I loved looking at Paper Girls as much as I loved reading it. To say this issue hooked me would be an understatement. You owe it to yourself to give it a read. Assuming Chiang can keep up a decent schedule with this, you're looking at the next runaway hit from BKV and Image.